A couple of computer software items have crossed my desk in the past few months that I felt warranted bringing to people’s attention. One because it represented a sophisticated attempt to take computer games beyond the level of simulated war and succeeds in being both interesting and educational without being boring. The second is interesting primarily as a model for emulation. Both, to my mind, represent a slightly higher consciousness about the world. The review constitutes my Earth Day rant. 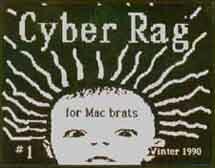 Plain and simple, Cyber Rag is a magazine on a floppy disk. Put the disk in your computer (in this case a Macintosh) and you get an animated intro followed by an interactive table of contents offering a choice of computer graphics, stories or games. Selecting one will bring you to a submenu specific to each category. In Cyber rag #1 (Winter 1990), editor Jaime Levy has gone to a lot of trouble to make the package appealing—sound effects, animated graphics and flashy menus—without really giving us anything memorable inside. The four graphics will probably be of interest only to others who create similar things. The three games consist of a National Enquirer-level quiz on Steve Jobs (who cares), a short morality play on drinking and driving and "Noriega tag," a cutesy little "try to catch Noriega in Panama" trifle. Of the three articles, "What is a disk magazine?," "Punching Pay Phones," and a "Hacker Manifesto," the latter two are reprints. So why do I like it? Because, as Levy accurately points out in his essay on disk magazines, you don’t have to cut down any trees to do it. As harsh as I’ve been on Cyber Rag, I get much more useless stuff in the mail on paper, representing not just trees but the chemicals and fumes associated with the printing process. As a publisher myself, I wish enough people owned computers to make electronic publishing viable. The ecological implications of having just the LA or NY Times delivered electronically instead of on paper are overwhelming. So to Jaime Levy I say, "Good idea, now let’s get serious." And to everyone else I point out that the technology is already there. When you’re ready to read electronically, publishers will start publishing electronically. So yes, recycle and save a tree, but in the long run, buy a computer and start saving the forests.